More links for "C80 Comfort Series Gaming Chair - Black/White"
My review of this chair. I've only ever had one PC chair of simular build, and it was cheap. I was apprehensive, about my next purchase. I DO NOT REGRET THIS CHAIR AT ALL. It is soo comfortable, great back support and i weigh around 15 stone. medium to large build, it fits so well. My only negative and it's down to preferance is it locks in it's seating position you cna unlock it to lean back but you can't lock it again to hold that lean back position. may require a drilled hole through the metal to have a second lock. As for installation, I found it very simple and easy to do. followed the instructions you litrally put 3 peices together and screw in thats it. very stylish and came well packaged. Thank you overclockers for a fantastic product and service. This is my first real gaming chair ive ever bought. I did have my eye on the Vertagear sl 4000 but ideally i didnt want to spend over 300 pounds on a chair and i have to say i have no regrets so far. Ive only had it two days but i have to say it was a breeze to put together on my own. Even though its not real leather its has a very "Premium" feel to it. It is very comfy to sit on for hours at a time. Im 5"11and of medium build if it helps, and the chair hugs me, support wise, but not overly so i feel like im being smothered. I was a bit worried buying from a new manufacturer of gaming chairs but i have to say, they have got it spot on (atleast for me) with the comfort series. I hope this helps someone looking at this series. 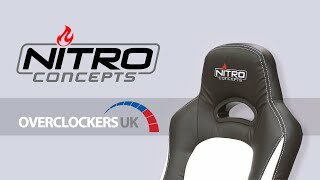 "The Nitro Concepts C80 Motion Series Gaming Chair is one of the best value options on the market today. It’s comfortable, looks great, comes in a wide range of colour options and would make a welcome addition to any desktop setup."